Judy Thomas Paintings on view at The Cornerstone Lobby Gallery through 2018. Judy Thomas' paintings are on view at The Cornerstone Lobby Gallery, Safe Harbors of the Hudson, 111 Broadway, Newburgh, NY, through 2018. These paintings, from 1984-1987 have survived several moves and are examples from a prolific period of Judy Thomas' work during her time living in Paris, West Germany and her first year in New York. These paintings were informed by chaos theory and the surrealist creative practice called automatic drawing or 'automatism', which she learned from studies with S.W. Hayter at Atelier 17 in Paris, while she was on a Fellowship through the Fondation des Etats-Unis from 1983-84. SPACE CREATE is pleased to present Judy Thomas’ new painting series MAPPING, in the main gallery at 115 Broadway, Newburgh, NY. In this exhibition, Thomas shows lyrical works that explore the formal elements of color, line and form, revisiting 20th century abstraction through a 21st century lens. Underlying the playful nature of Thomas’ new paintings is an investigation into broader concepts of chaos and chance. The inspiration for this series comes from the 1983 film Koyaanisqatsi, which in the Hopi language means life out of balance. The film is a juxtaposition of images and music by Phillip Glass, and describes the history ofmans impact on the planet and the end with the ancient prophecies of the end of the world. Thomas begins each painting with her own version of the surrealist technique automatism which has informed her work for decades. As each painting develops, Thomas imparts a formal eye to the original marks and shapes, moving lines and forms to better serve the composition. It's playing with mapping as a construct, framing time, relationships, even identities. It's exploring how we all chart our lives. Judy Thomas with friends at the Black & White Gala at Teran Studio, Newburgh, NY. The mobile sculpture was created in Judy Thomas' Ritz Box Office studio. 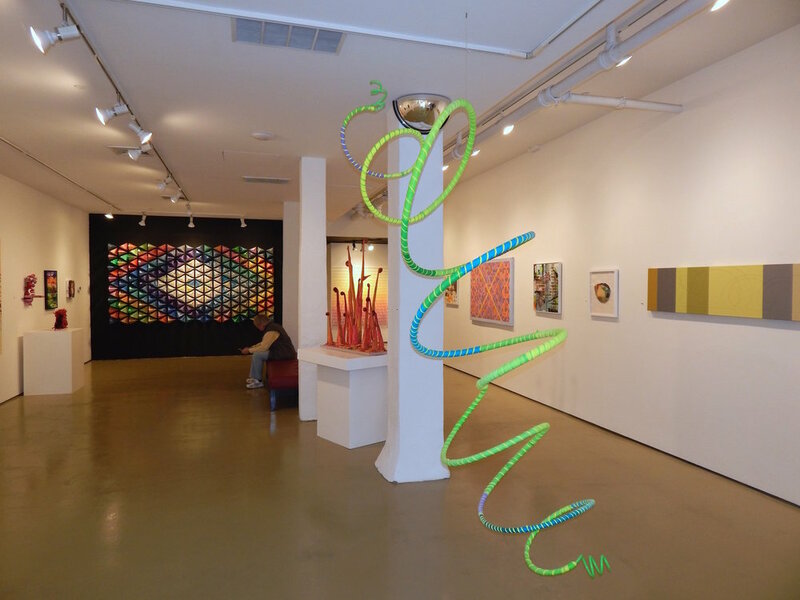 Weathervane Gallery opens its new season with a sculptural installation by artist Judy Thomas. Composed of one curved line, ‘Kaleidoscope’ is a lyrical ‘painting’ in 3-dimensional space. Using simple industrial materials like PEX, vinyl, and hosiery, Thomas has transformed the gallery into a sculptural wonderland that activates the senses. Colorful tendrils unfurl and intertwine in a weird curvilinear space, suggesting a Dr. Seussian world of ribbons or musical notes. The play of light and shadow, real and implied volume and high key color that Thomas practices in her work evokes a sense of wonder and a feeling of pure joy that speaks to all generations and revisits 20th century abstraction through a 21st century lens. Thomas’ work is informed by scientific theories of chaos and order, particle explosions, string theory and the butterfly effect - in which a small change at one point can result in large differences in a later state. Underlying the playful nature of Judy Thomas’ work is an investigation into the formal elements of color, line and form, and scientific theories of chaos and order, particle explosions, string theory and the butterfly effect. These 3-dimensional ‘paintings’ revisit 20th century abstraction through a 21st century lens. The pioneering, renegade spirit of the early 90's helped to shape the direction of Judy Thomas’ art, when she began to create temporary, large scale sculptural works in abandoned warehouse spaces along the waterfront in Brooklyn. Recent installations include work in The Arsenal Center for the Arts, Brandeis University and the Samuel Dorsky Museum of Art. Thomas won a 2015 Individual Artist Commission grant from Arts Mid-Hudson for her community-responsive piece MATRIX:RENEWAL. Her work has been featured in the New York Times, Boston Globe, Time Out New York, The Detroit News, Huffington Post and the Mid-Hudson Times. Thomas lives and works in Newburgh, NY. This performance is NOT TO BE MISSED!! Hudson Valley musician Neil Nail Alexander plays his unique brand of jazz fusion synth and electric piano for the project launch of Judy Thomas 's site-responsive sculptural installation 'MATRIX:RENWAL'. DOORS OPEN at 6PM. PERFORMANCE at 7PM. FREE & OPEN TO THE PUBLIC. MATRIX:RENWAL will begin June 1st, and continue through the end of June, 2015. A lifeless storefront in the city of Newburgh, NY will be transformed from an empty shell to an energized colorful environment in Judy Thomas’ upcoming sculptural installation ‘MATRIX:RENEWAL’. Thomas, who was awarded a 2015 Individual Artist Commission grant from Arts Mid-Hudson to realize this project, is excited for this opportunity. “The challenge is to engage the community to create something fun as well as thought provoking,” Thomas explains. The social and cultural environment of the community is an important aspect of Thomas' approach to her art. 'Matrix:Renewal' will take place at 87 Ann Street, which was donated to Thomas for the duration of the project. The building has seen many businesses over its lifespan, most recently a store for handmade fair trade goods. Thomas will give consideration to the architecture of the space, the history of the space and its future also. She hopes to send a message that this is a safe and creative drug-free zone. 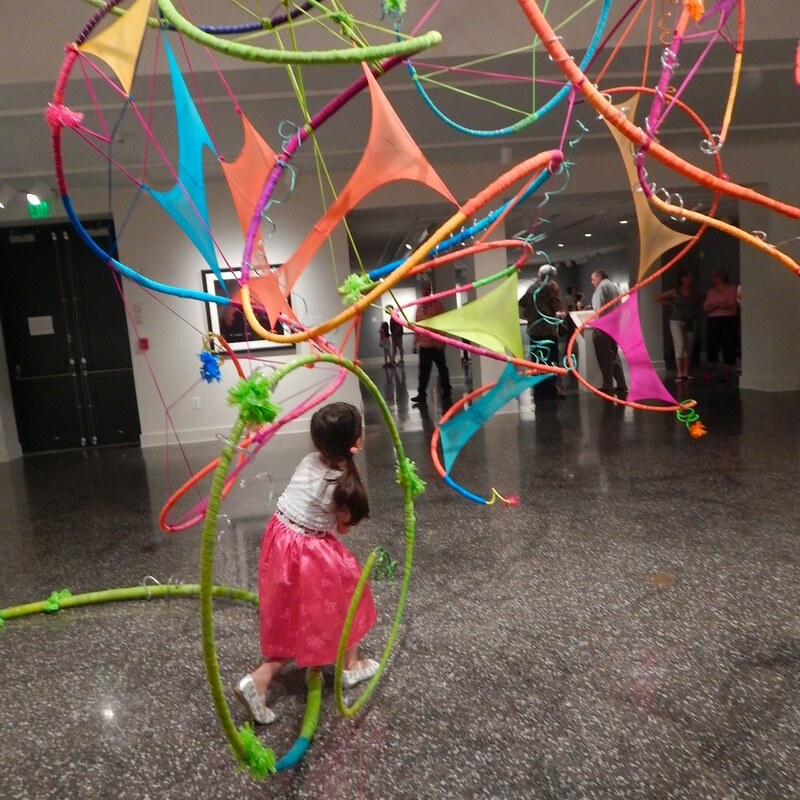 One component of the June 2015 installation will be dozens of colorful balls made from recycled plastic shopping bags, that Thomas fondly calls ‘Troubles’, named after the ‘Tribbles’ of Star Trek fame. She has invited youth from The Boys and Girls Club of Newburgh to help in the creation of the 'Troubles' and other parts of the installation. 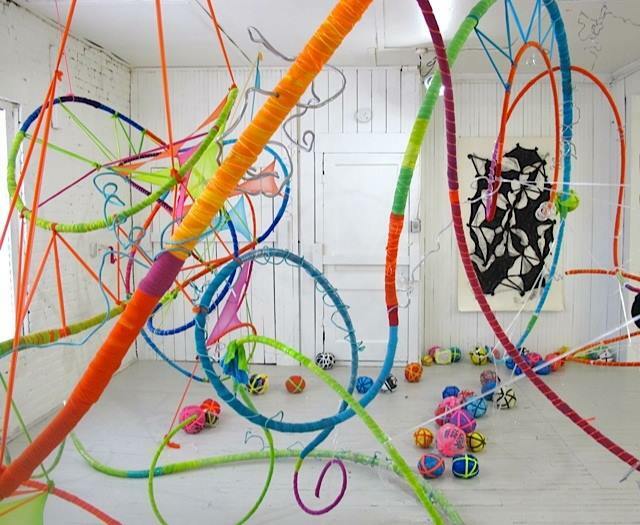 Donations of old newspapers and plastic shopping bags will be the materials used to create ’Trouble balls’. These balls will become part of the installation and will be given away at the end of the project as souvenirs. plastic shopping bags, newspaper, tape. The ‘Troubles’ will be brought outside during the 2015 Newburgh Illuminated Festival on June 20th. By placing art in a public setting, Thomas will be sharing her art making process with a community that has limited access to arts programming. Thousand of attendees are expected to fill the downtown area for the Festival. The creative and interactive process of making MATRIX:RENEWAL will be documented by filmmaker Alysia Mazzella. A Kickstarter campaign is being planned to fund the film. Judy Thomas’ work has been featured in the New York Times, Boston Globe, Time Out New York, The Detroit News, Huffington Post and the Mid-Hudson Times. Thomas’ recent piece ‘Expansion’ was included in the Hudson Valley Artists 2014 exhibition Worlds of Wonder at the Samuel Dorsky Museum of Art. Learn about Judy Thomas and view more work on her website, archives and facebook page. SPONSOR AND PROMOTIONAL OPPORTUNITIES. We invite you to become a Project Sponsor in support of MATRIX:RENEWAL. As a “Project Sponsor” your company logo is entitled to being credited in marketing materials (physical and digital) and in the documentary film. Copyright © 2015 Judy Thomas, All rights reserved. One of the most anticipated art events in the Hudson Valley region is the Samuel Dorsky Museum of Art’s annual Hudson Valley Artists exhibition, now in existence for over twenty years. Worlds of Wonder is curated by Ian Berry, Dayton Director of the Tang Museum at Skidmore College, who will lead a tour of the exhibition at 4 pm on June 21, preceding the opening reception. Berry is a specialist in contemporary art and a leader in the field of college and university museums. He joined Skidmore as the Tang’s founding curator in 2000 and was named director in 2012. Possibly the pièce de résistance of the show is Judy Thomas’s Expansion ― a curvilinear exuberance of tubing wrapped in orange, purple, blue and green with clear tubing pole- dancing around it, the whole held together by various materials including a favorite of Thomas’s: colored pantyhose. The piece also includes another signature element of hers: handmade soft balls. Among the events planned during the course of the exhibition is Senses of Wonder on June 29th during which Thomas will lead people through the sculpture allowing them to touch the parts.